The error message below will happen on any carrier, when carrier underwriting questions that come up during quoting are not answered within 5 minutes. So, if you get this error, simply resubmit the quote, but this time be sure to answer the “Carrier Needs Input” questions within 5 minutes. When running a quote, sometimes a “Carriers Needing Your Input” box appears at the top of the page, or you may see a “CARRIER NEEDS INPUT – CLICK HERE” link next to a carrier. Watch for these during quoting. In either case, click the link and answer the carrier’s underwriting question(s) and click SUBMIT. Continue to do this as necessary and you will receive successful quotes. 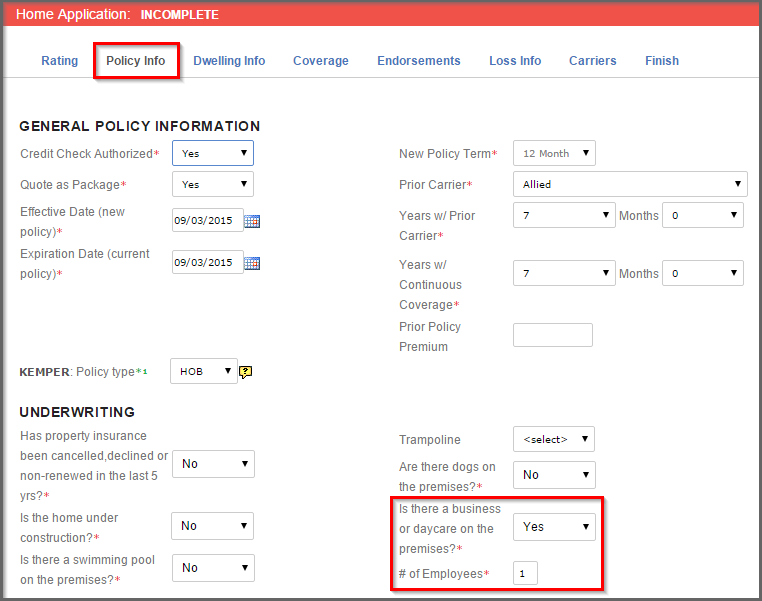 To fix this, simply click the Policy Info tab, find the “Is there a business or daycare on the premise?” question and select “No”. (2nd screenshot below) Now go back to the Endorsements tab and the “Business Pursuits” field will be unchecked. This error message happens when your Infinity agent code is not incorporated into the username and password you use to log into the carrier website. Call Infinity at (800) 264-7516. Explain the error message you are receiving in EZLynx and they will change your carrier login to include your Infinity agent code. 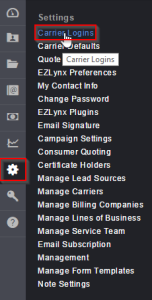 Next – hover over the Settings icon in EZLynx, and select Carrier Logins. Update the Infinity login, then resubmit your quote and Infinity will return a successful quote. Share this information with the other EZLynx users in your office while you’re at it! Are you having trouble finding your EZLynx quotes in Safeco’s website? Here are a few steps below to assist you with locating your quotes. Receiving the “Unable to initiate Personal Lines quoting on the carrier website” error? Are you receiving the “Unable to initiate Personal Lines quoting on carrier web site”error? 1) The carrier username and password set in EZLynx is no longer valid. Go to the carrier site by clicking the logo for the carrier and test your credentials. If correct, Go to the Settings tab, click Carrier Logins and update the login with a valid username and password. Then resubmit the quote. 2) An incorrect agent code is entered on the Carriers tab in the application. Essentially, the carrier is unable to start the quoting process because it does not recognize the agent code being used. Go to the Carriers tab of the auto and/or home application in EZLynx. If the Agent Code for the carrier is incorrect, update it and resubmit the quote. At the Rated Driver field choose “Excluded” instead of “Rated”. Then at DL Status field, choose “Not Licensed“. This is an accurate way to complete the application, however several carriers may return a valid error message regarding the license status. It is an underwriting issue particular to each carrier. Some carriers require certain risks be quoted directly on their website. Receiving the “Unable to login to carrier website” error? The “Unable to login to carrier website” error usually means there is one of two problems with the Carrier Login that is set in EZLynx. 1) Be sure you can log directly onto the carrier’s website with your current username and password. Type the password yourself instead of letting it automatically pre-fill. Once you’re able to log directly onto the carrier site, check that the same username and password is set in EZLynx by going to the Settings tab, then Carrier Logins. 2) The Carrier Login only needs to be set as Default – setting the default covers all rating states. 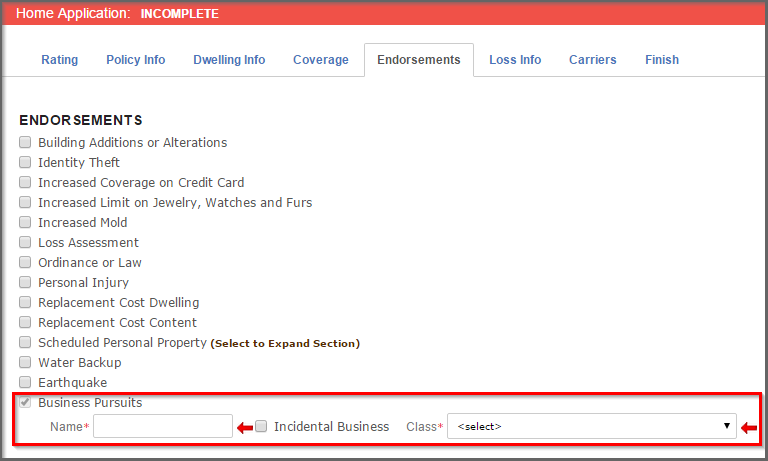 If a state is set, click the Edit button next to the state setting, then click Clear.After fixing one of these issues, resubmit for a successful quote.